Even though I have been a writer for a long time, I have never written a book. 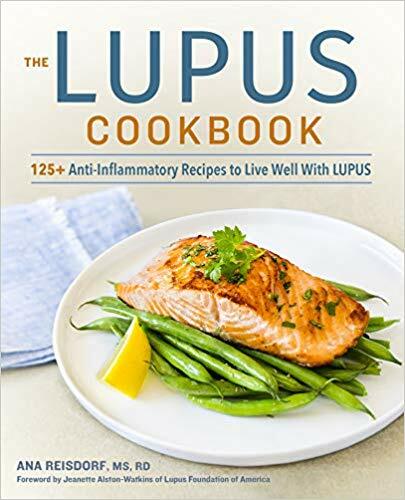 Earlier this year, a publisher approached me to write a cookbook called “The Lupus Cookbook: 125+ Anti-inflammatory Recipes to Live Well With Lupus“. I have written a bit on autoimmune disease in the past. I also had personal experience with diet helping change the course of my own “possible” autoimmune disease. I would like to present my first book which will be available on November 27th! Electric jar opener: I like this one by Hamilton Beach, makes opening jars when you are struggling with joint pain a bit easier. Glass storage containers: You always want to use glass instead of plastics to store food, particularly if you will be using these storage containers in the microwave. Slow cooker + liners for the slow cooker for easy cleanup: There is nothing like the smell of a pre-cooked dinner when you get home from work. Garlic press: who wants to smell like garlic anyway? High-power blender: the Vitamix is definitely worth the investment, this baby can blend anything! Mandolin: quick and easy way to get perfectly sliced veggies. Toaster oven: or when you really don’t want to turn on the oven. Even if you don’t have lupus, these kitchen gadgets can make food prep a breeze! If you have lupus, or know anyone who does, check out the Lupus Cookbook on November 27th! Looking for a ghostwriter for your next nutrition book? Contact me!